We should admit that a well tagged MP3 collection makes everything from organization to playback easier. But not everyone is fortunate enough to have a perfect music library. There are still so so so many people now suffering lots of a music library with missing or even misspelled song details. If you are the one of them, you come to the right place since I am about to show the solution on how to fix and edit ID3 tags automatically. Before showing you how to edit ID3 tags automatically and 3 best ID3 tag editors, I would let you know What is ID3 tag. ID3 is a metadata container most often used in conjunction with the MP3 audio file format. It allows information such as title, artist, album, track number, and other information about the file to be stored in the file itself. An ID3 tag is actually a metadata container, which is used to describe the music itself and stored in the music files. Ideally, an ID3 tag would include information about a song, like track name, artist, genre, release year, album artwork and even lyrics. If you collect MP3s from disparate sources, the MP3 ID3 tags are probably in shambles. Some of the tracks may have only the artist labeled, others only the song title, while still others may have all the information you need. If you want to keep your music collection well organized, editing the ID3 tags is pretty essential. You know that a well tagged music library makes everything from organization to playback easier. If you have a large music collection in iTunes, it’s quite common for you to encounter such a problem – the songs you downloaded from online or ripped from CD have no essential tags like artist, album, genre, name, year, etc. It will cause troubles when you want to identify one song, organize iTunes, sort songs properly, or choose what to listen. It can be said that ID3 tags perform a crucial role on refreshing your music enjoyment. Currently most software media players have built-in tag editors that you can use to edit MP3 metadata manually. But that’s really time and energy consuming if you have a large selection of music tracks that need tag information added. So today I will show you how to add ID3 tags to MP3 automatically and top 3 music tag editors. Then you will save a lot of time and ensure that your music files have complete tag information. If your songs come with incomplete, incorrect or unmatched tags, your music player will not be able to sort and manage songs properly. Fortunately, it’s not a big deal to change ID3 tags for your music collection just with the help of Leawo’s ID3 Tag Editor. 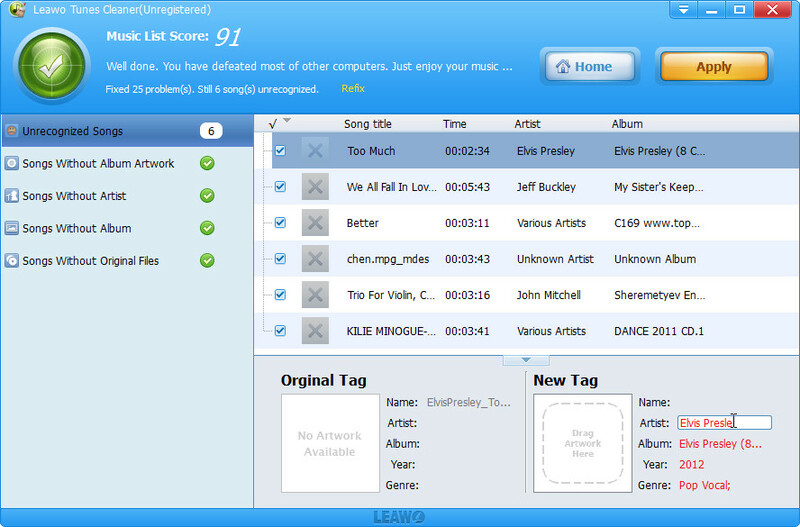 This MP3 ID3 tagging software could find missing ID3 tags from online and embed them to MP3 files automatically. You can import as many songs as possible to it and change the ID3 tags in batch. If you feel unsatisfied with the auto fix results or your songs come with incorrect tags, you can still edit the ID3 tags by yourself just with the in-built ID3 tagger. Can’t wait to give it a try? Please get the MP3 tag editor free downloaded through below downloading link and follow the detailed tutorial. Run this MP3 metadata editor after installation. As soon as it opens, you could click “Start to clean iTunes” button, or hit “Open music file” to find all songs with incomplete ID3 tags on your iTunes and other music library. All songs with incomplete tags will be listed on program interface as the scan is over. You will find categories like “Songs without album artwork”, “Songs without artist”, “Songs without album”, etc. displayed. Then you could enter each category, choose the songs you need to change ID3 tags, then click “Apply” button to download missing tags from online and embed to MP3 files with a click. If you find some songs in collection with unmatched tags, you could take use of the in-built tag editor to edit tags like Name, Year, Artist, Genre, Album, etc. by hand. Just choose the song and type in the correct information on program bottom panel. Want a free music tag editor to help you identify the songs thru adding missing tags? MP3Tag is your choice. The software comes with an extremely easy-to-use interface which makes the tags identify process a lot faster and a lot easier. You can use it to edit tags include the title of the song, the artist, the album, the album art, the year it came out, what track number that particular song is, and the genre. MP3Tag offers online database lookups from sites like Amazon, discogs or freedb. You can really save time with the batch ID3 tag editing feature, especially when you need to edit multiple songs at once. MP3Tag supports most of the common metadata formats including ID3v1, ID3v2.3, ID3v2.4, iTunes MP4, WMA, Vorbis comments and APE tags, so you will have no problem on managing your music regardless of the type of music you have. 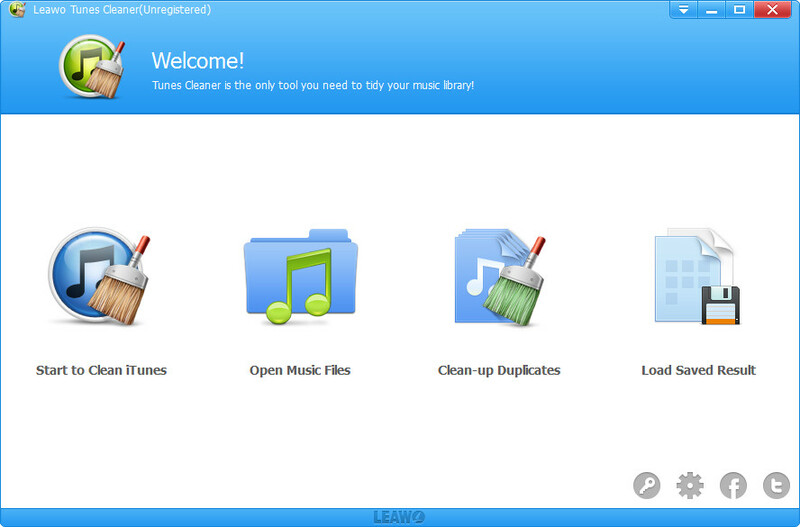 A tool gets iTunes duplicate remover, album cover finder and MP3 metadata editor into perfect combination. You can use it to delete duplicates in iTunes, add album artwork to music, and fix ID3 tags automatically. This MP3 tagging software supports online lookups for tags, so you can complete the song information like artist, album, song name, album art, year, genre, etc. just via downloading from online database. Leawo Tunes Cleaner could also perform as a batch MP3 tag editor, allowing you edit ID3 tags in batch for time and energy saving.If you are unsatisfied with the auto fixing result, you can still use its built-in tag editor to edit metadata manually. 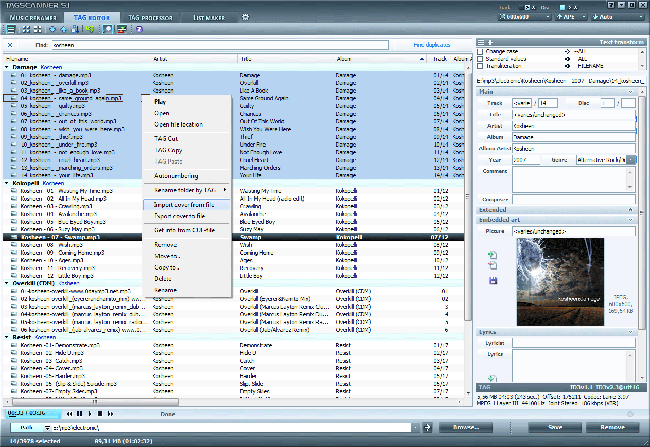 Another MP3 tag editor freeware to help you organize and manage your music collection. 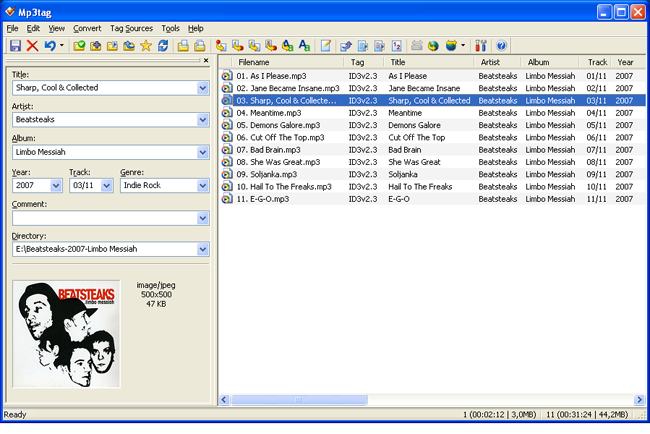 TagScanner supports most of the popular audio formats. It also comes with a built-in player. It could automatically fill in your msuci files’ metadata using online databases like Amazon and Freedb along with auto-renaming files based on tag information. Another nice feature is it could export playlists as HTML or Excel spreadsheets for cataloging your music collection. One pro is, the layout of TagScanner is confusing. You may need to take some time to get yourself familiarized with its user interface. You can add missing metadata to your music collection in absolutely no time, just with above best MP3 taggers. Then it will be much easier for you to navigate your albums and find the songs you want when you want them.